ustang Deluxe Anti-Exposure Coverall & Worksuit (XXXL) - Mustang Survival's MS2175 Deluxe Anti-Exposure Coverall and Flotation Work Suit is designed with Mustang's Airsoft™ foam for a lighter and more comfortable fit than the MS2075 Coverall Flotation Suit. Comfort Cuff™ technology creates a relaxed, comfortable fit around the wrists, and is matched by the overall relaxed and comfortable fit of the suit design. 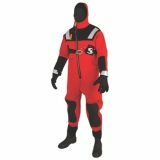 Featuring two chest pockets, large front cargo pockets and an inflatable head pillow for additional in-water support and buoyancy, this suit blends functionality and features to meet the demands of a wide-range of professional and industrial uses.